Along this track, as recently as the last century, young children, barely able to walk, were sent far away to Germany. Their parents couldn’t afford to feed them so, rather them seeing them die, they were despatched to work on large feudal estates. Some didn’t make it, frozen by the elements or eaten by wild animals, and most never returned. Ancestors of the Walser, as these people are called, had left the Valais region in Switzerland several centuries earlier and headed east over the high passes. They settled in Northern Italy, Liechtenstein and Austria on the high ground, poor land that nobody wanted. They cleared the trees so they could graze cattle and goats but few crops grew well so food was scarce. This is Vorarlberg, the westernmost territory of Austria, at the eastern end of Lake Constance. 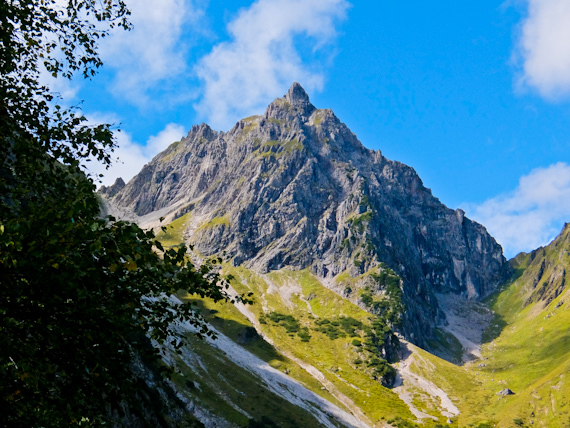 The region is bordered by Liechtenstein, Germany and Switzerland and two valleys, the Kleinwalsertal and the Grosses Walsertal are named after them. These days times are better but they still take the cows up to the alpine pastures every summer before bringing them down for the winter. The train from Geneva drops me off in Bludenz and I make my way to the small village of Faschina and check-in at the Alpenresort Walsertal. This area of Grosses Walstertal is designated a UNESCO Biosphere Park, basically a protected eco-system which only allows sustainable farming methods. This steep sided valley is bounded by the soft green mountains of the Flysch in the north and the craggy peaks of the high Alps in the south. 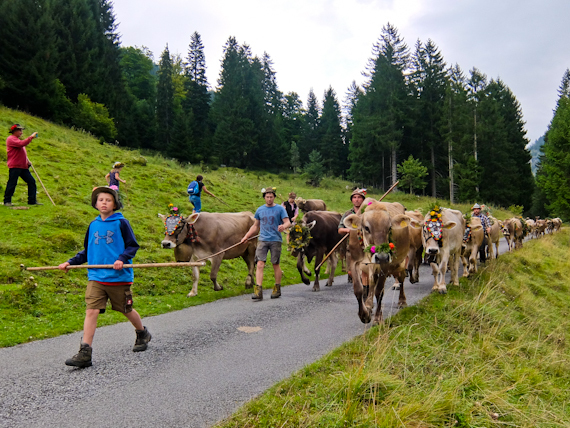 It’s the time of the year when the cows are being brought down from the mountain and next day, as I hike round the Zafernhorn, I meet a group of animals on the road. Their horns are adorned with flowers and it’s a family occasion with the children leading the throng. When they reach the valley floor there’ll be a celebration with music and much drinking. Around 1000 farmers still work on the alpage, looking after over 40,000 animals, so this weekend there’ll be festivities all over the region. Back at the hotel, I’m told I have to fish for my supper so I set out with the young chef to the ponds where they farm Char. 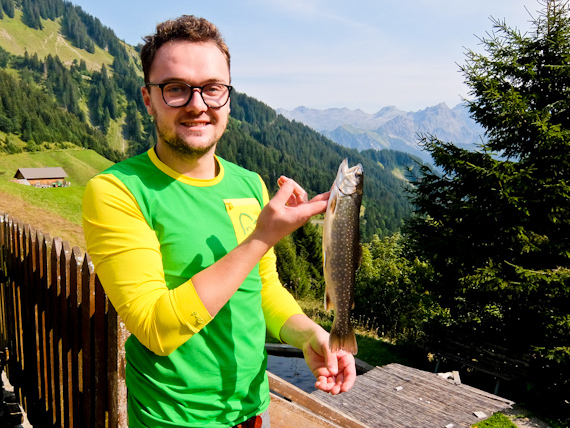 I’m given rod and bait and cast into the water repeatedly but am completely unsuccessful. The fish are not biting so we net one and take it back to the kitchen. The chef fillets it and shows me how to cook it three ways – grilled, boiled and deep fried and it couldn’t be fresher. Next day I’m going to the high alp and take the bus from Marul to Alpe Laguz. On the way we have to pull off the road and wait for another group of cows to pass, accompanied by excited children. Laguz is nothing more than a handful of alpine huts, now vacated for the winter, as we’ve just passed the last of the cows on their way down. The bus can go no further so I set out on foot, climbing steadily to reach the watershed. The limestone turns red here, due to iron ore deposits and the mountain wall above, appropriately, is known as the Rote Wand. Now it starts to rain as I make my way past the Formarinsee, apparently Austria’s most beautiful lake, nestling in the mountains, suddenly obscured by clouds. My destination is the ancient Freiburger Hut and when I arrive they’re celebrating their 150th anniversary. There’s a trio of alp horns giving a rather discordant rendition of popular tunes and speeches by local dignitaries included the parish priest. He’s from India and jokes that there are more people assembled here than attend mass on Sundays. 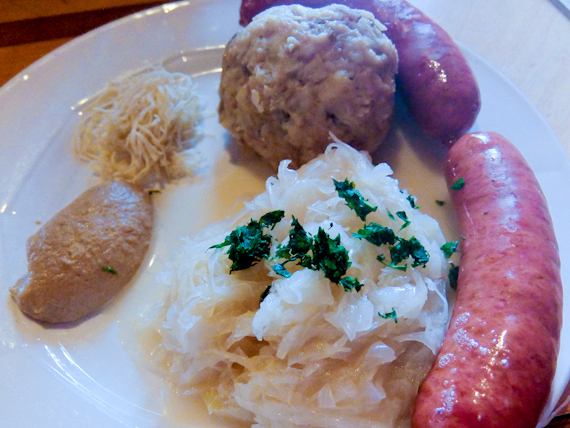 Certainly, the food is the main attraction – sausage, dumpling, sauerkraut and shavings of horse radish and mustard and beer. It’s now raining heavily as I take the bus to Lech, an up-market ski resort attracting the likes of the Dutch royal family and the King of Jordan. 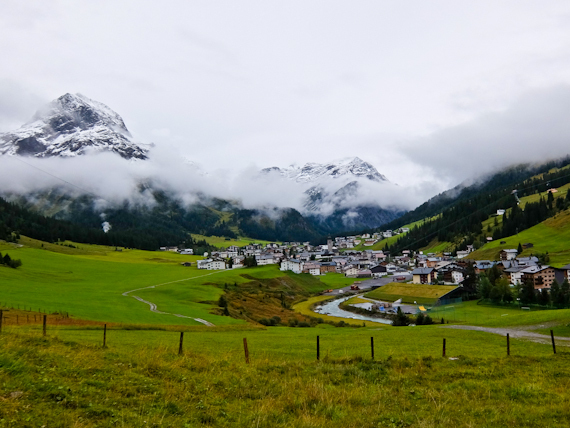 This was one of the last places settled by the Walsers and here I join the Walserweg, a 30-day long-distance footpath, starting in Switzerland, linking the ancient Walser villages. The path is tinged with sadness as this was also the route their unwanted children took on their way to Germany. Snow has fallen overnight and the slopes are dusted with white so I appreciate how hard it must have been for these young travellers. Clouds hang on the tops so I stay in the valley, following the River Lech downstream through a wooded gorge, then climb up to Bürstegg. This was once a thriving village but now is nothing more than one house, a tiny chapel and a handful of barns. Further on is Warth, still only home to 180 residents, but given a new lease of life as a ski resort. In September, however, the pleasant Sporthotel Steffisalp is mostly deserted. 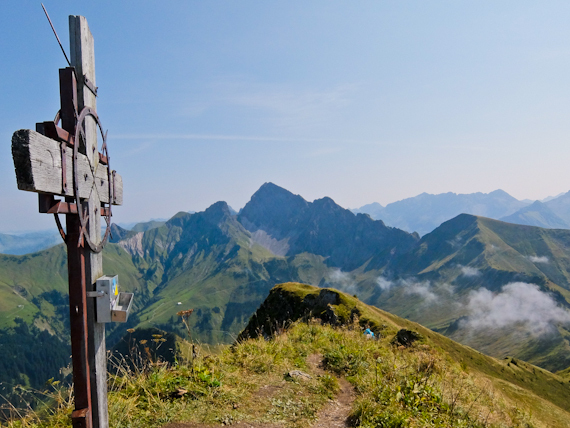 Picking up the Walserweg next day, I walk along the road to Hochtannberg and then climb up to the Widdersteinhütte at 2015m. 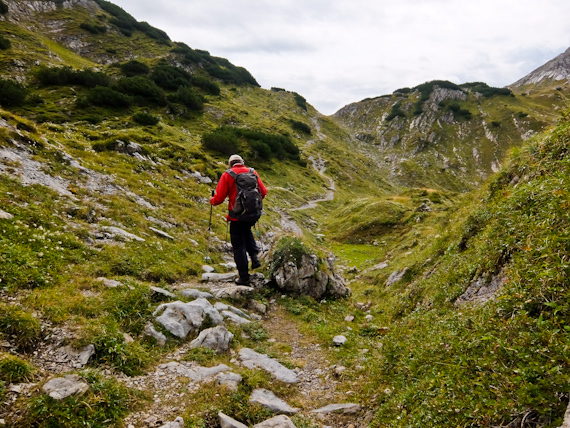 I cross the ridge and begin the steep descent into Kleinwalsertal. 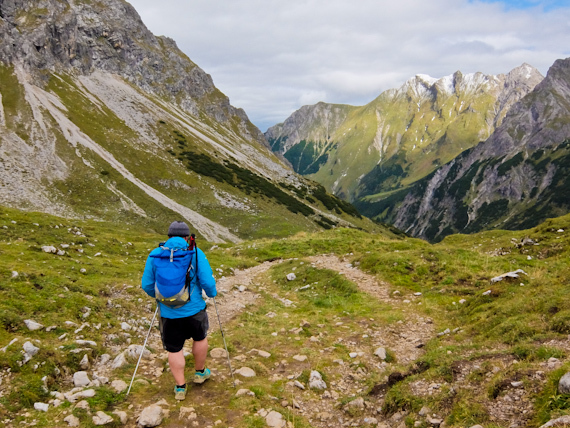 This valley is only accessible by road from Germany, even though it’s part of Austria. There were plans to link it to the rest of the country but the local folks vetoed it. They reckoned that if the tourists could go no further then they’d have to stay and spend their money. It’s a beautiful spot, surrounded by pine trees and rugged mountains and the end of my road is in Hirschegg. I spend a pleasant night at the Hotel Gemma before retracing the route those Walser children took all those years ago. Unlike them, there’s no need to walk – I take the train to Munich. 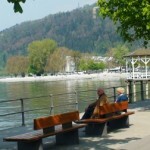 Vorarlberg Travel has information about the region. Kleinwalsertal has information about the valley. 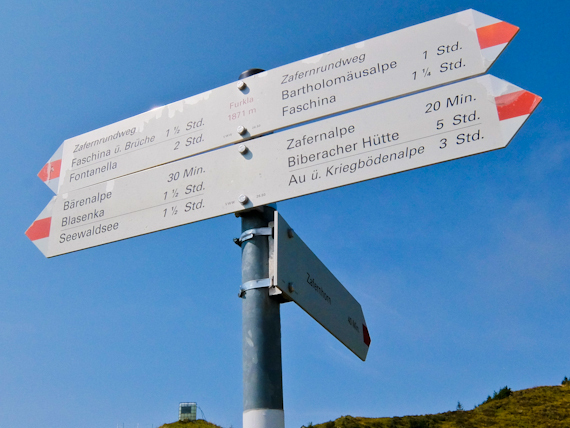 The Austrian National Tourist Office has information about the country. Alpenresort Walsertal is situated in the UNESCO Biosphere Park. Sporthotel Steffisalp in Warth is next to the ski lift. 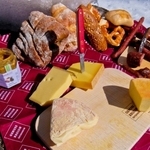 Hotel Gemma is a comfortable base in Kleinwalsertal. SWISS flies daily from London Heathrow and London City to Geneva.